It has been exactly 500 years since Martin Luther nailed his 95 theses to the door of the Castle Church in Wittenberg, an event that shook the world and changed Christianity forever. The legacy of Germany’s famous son—monk, professor and church reformer—is evident not only at Luther sites in Wittenberg but throughout the country. Church groups considering a trip to Germany can expect festivals, exhibitions and special programs, all paying a tribute to Martin Luther and the Age of the Reformation. Such events have been held to celebrate the Luther Decade since 2008, and the celebration reaches a crescendo in 2017, marking a final chapter in this religious milestone—the birth of the Protestant Reformation a half millennium ago. In 2017 and beyond, your group can follow in the footsteps of Martin Luther throughout Germany and embark on a fascinating journey back to the momentous events of the 1500s. LutherCountry is a popular tourism region located right in the heart of Germany, between Frankfurt (Main), Munich and Berlin. Visitors from around the world flock to its storybook towns, historic churches, mighty castles and enchanting countryside. More than 30 Martin Luther-related sites—places where the great reformer lived, studied and preached—are scattered throughout LutherCountry, but the most important ones are concentrated in four towns. Eisleben is where Luther was born in 1483 and died in 1546. He spent more than 35 years in Wittenberg, which has attractions like the Luther House as well as Castle Church. At Wartburg Castle in Eisenach he translated the New Testament from ancient Greek into German, making God’s Word accessible to the common man. In the beautiful city of Erfurt, Luther served as a monk at the Augustinian Monastery, now a pilgrimage center. Download the “Luther 2017” eBrochure and find eight inspiring routes and ideas at www.germany.travel/ebrochures. Germany’s well-developed infrastructure, from high-speed trains and rental cars to intercity buses and domestic flights, makes traveling a breeze. And with nearly 500 flights weekly between the U.S. and Germany, getting there is convenient, too. Another plus: Germany’s prime location in the center of Europe. 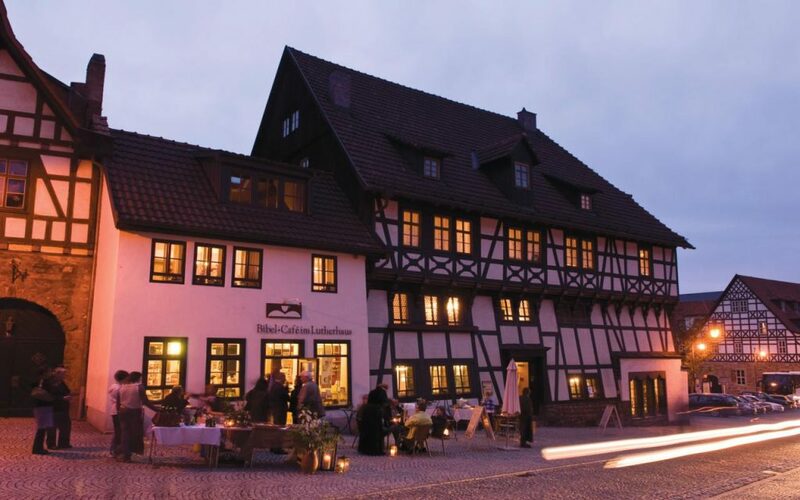 Renowned for the high level of its hospitality services, Germany has a broad range of hotel accommodations in every category and boasts some of the lowest hotel rates in Europe. The favorable euro-to-dollar exchange rate at this time makes Germany an excellent value for the American traveler. For those who cannot make it to Germany for the 500th anniversary events, sightseeing in LutherCountry may be an even more attractive option in 2018 and beyond, when the crowds will be smaller and prices lower. And visitors will still enjoy the fresh look of the sites that were renovated for the big celebration. For more information on Germany, visit www.germany.travel.